At the Round Rock Bahá'í Center in the Austin, Texas, suburbs it's not with silver bells and cockle shells. It's with lots of sweat equity from residents growing produce for their families and a local food pantry. And more than luscious black-eyed peas, tomatoes, watermelons, chard and the like are sprouting. Friendships are, too, giving rise to many spiritual conversations as gardeners inquire about their hosts' faith. The Unity Park Community Garden, as the one-acre parcel is called, germinated from the seed of a request from local couple Lori and Jeff Ferris. They founded the Neighborhood Harvest Project and approached several faith communities with the idea of a garden that would promote healthy local food and sustainable living. Only the Round Rock Spiritual Assembly said yes, according to Marie Caldwell, Assembly liaison to the project. The Assembly decided, after consulting with the Bahá'í community, to rent the acre for $1 a year with the understanding another acre would be made available once the project grew sufficiently. Unity Park — the Ferrises were touched by the Bahá'í teachings on unity, says Caldwell – opened to the public in February. Aiding the effort have been a water line run from the Bahá'í Center; fencing paid for with sponsorships; tools and a shed bought with a Fiskars Project Orange Thumb grant; and a pollinator garden and picnic table funded by Keep Austin Beautiful. Along with the efforts of anyone willing to dig in. "During the construction phase there were many work days with anyone who had reserved a plot and others in the community who volunteered to help," says Caldwell. Eighteen rented plots — ranging from 10 to 20 feet long — and two plots designated for the food pantry were tended over the past six months. 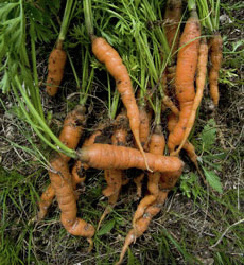 "Each gardener has to sign a contract to donate 10 percent of his or her produce grown to the local food pantry here in Round Rock," notes Caldwell, who herself tended a plot although having no prior experience. Gardeners also have to volunteer six hours per season "to help maintain the public areas of the garden and the pantry plots," she says. It's paying off — for participants and the food pantry. 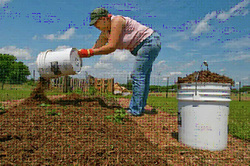 "Gardening is the cure-all," Lori Ferris told the Round Rock Leader in one of many media reports on the venture. "It's good exercise for you and it yields healthy food, too." "We're created a garden where everyone is welcome to grow and learn," Jeff Ferris said in a release announcing the Fiskars grant. "Finally, Round Rock has a community garden where people can get together, share ideas and expertise and learn more about gardening no matter what their skill level." People like Holli Haswell and her son, who bought a plot and have watched it sprout tomatoes and peppers. "At the end of March, this was nothing but an empty field," Haswell related to News 8 Austin. "By hand, we plowed everything with a shovel and a rake, basically. Three months later, here you go." Leah Adams was attracted by the opportunity to give back to the community. 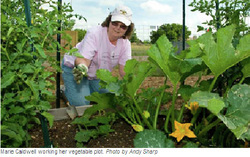 She has a garden at home but decided to grow tomatoes, peppers and cucumbers at Unity Park. "I used to be dirt poor, and there were people that helped me," she told the Austin American-Statesman, "so it's just nice to be able to help other people." Caldwell says that as of this writing "Unity Park has donated more than 52 pounds of fresh, organically grown produce to the food pantry." That's significant because the food pantry had seldom before been able to offer fresh food alongside packaged items. A second growing season — one that probably will result in even higher yields as the summer's heat dissipates — was to be inaugurated Aug. 28 with a ribbon-cutting ceremony and sharing of dishes made with food grown in the garden. Probably touching off another round of media reports, and more opportunities to satisfy public curiosity about the Faith. "We have had numerous opportunities to be interviewed by the media, both television and the local newspapers, raising questions about the Bahá'í Faith," says Caldwell. "This has generated more conversations with the gardeners about the Bahá'í Faith and people have called for more information. "While gardening, I've even had people drive into the parking lot to ask questions about garden plots and about the Bahá'ís." She personally has "developed several friendships and had many firesides with the other gardeners." The Center also has been opened for gardening classes, and participants have left with information on the Faith. "We haven't had any enrollments," says Caldwell, "but I know we have made many friends of the Faith through this community outreach program." Which, to her, is key. "Not only are we feeding people with locally grown fresh produce, we are feeding their souls with the Words of Bahá'ulláh."